Jim Krumel: Take it from two WWII vets — Vote! Tomorrow is Election Day and Sunday is Veterans Day. A week doesn’t get more red, white and blue than that. Lately when I think about voting and veterans, I think of two brothers — where they came from, what they’ve experienced and what they believe. No one has to tell them it’s an honor to vote or they should be respectful when hearing the national anthem. That lesson was taught to them while growing up on a farm near Ayersville during the Depression and later while serving during World War II. One of those brothers ended up with severe frostbite in Europe during the Battle of the Bulge. His name is Earl Krumel. I call him “Uncle Earl.” He’s 96 years old. The other brother is Don Krumel. He sweated it out in the South Pacific, getting ready for the invasion of Japan. He’s now 94 years old and I call him Dad. Dad hasn’t missed a vote for 72 years and Uncle Earl has missed just one when an illness got the best of him. We spent a recent afternoon together talking about all of those things. “The other day I read about a guy walking six miles to vote,” Dad recalled. “He got there and learned he was in the wrong place. He walked five more miles only to find the polls were closed. He was devastated. … It meant so much to him to vote. For the life of me, what happened that people don’t feel that way anymore?” Dad asked. America was deep into World War II when the two brothers received their draft notices in the mail. It didn’t come as a surprise as others they knew were also being called to duty. Uncle Earl’s letter arrived in December 1942 and Dad’s was delivered three months later. His destination was to go to Camp Perry in Port Clinton, Ohio. He was later stationed in Texas and Mississippi, where he was trained to use weapons that could knock out a German tank. He served under five-star General Omar Bradley in France, Germany and Belgium before being sent stateside due to frostbite. Uncle Earl recalled seeing the Statue of Liberty on his trip back from Germany to America. “It was the most beautiful sight these eyes have ever seen,” he said. Dad, meanwhile, was put on a train for Camp White in Oregon. He was the only person in his group of inductees to be sent west, everyone else went east. It turned out that train ride would be nothing compared to the 35 days he would spend on a ship heading for New Guinea. When the atomic bombs were dropped on Japan ending the war, Uncle Earl was in Omaha, Nebraska, recuperating, and Dad was in the Philippines where the Army, Navy and Air Force were making final preparations to invade Japan. “It would have been a bloody battle had the invasion taken place. I cannot begin to describe how elated everyone was,” Dad said. 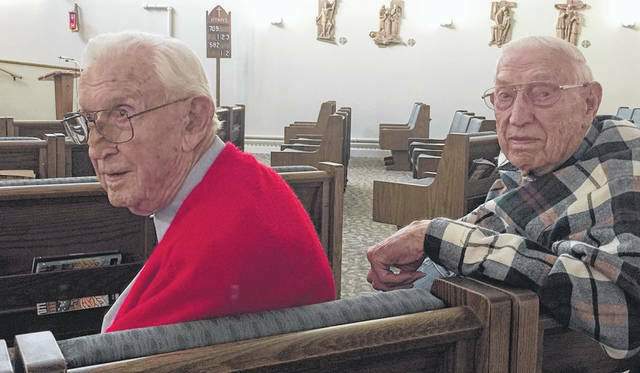 The two brothers now live at Rosary Assisted Living Center in Sylvania. They’re planning on voting Tuesday, because as of Saturday, had not received their absentee ballot. ROSES AND THORNS: Hmmm … smells like someone is cooking chicken in the rose garden. 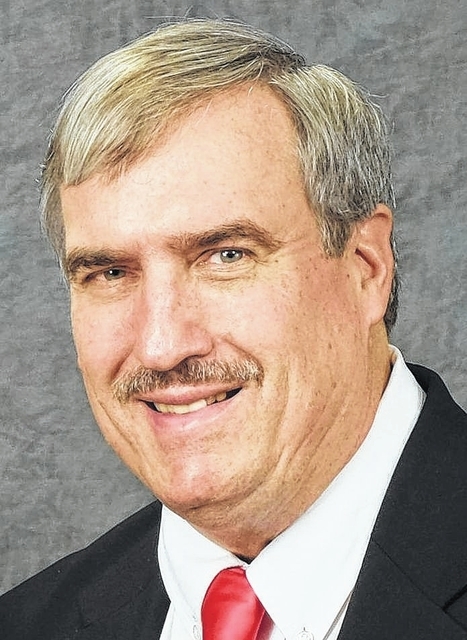 Rose: To Ralph Bennett, who is retiring after 44 years of coaching track and cross country. Thirty-five of those years were at Lima Senior and nine at Lima Central Catholic. Most of this was done while maintaining a full time job at Ford, as well. Thorn: Maybe they don’t need the cash, but someone purchased a lottery ticket from Knap’s Carry Out in Coldwater that is worth $10,000 and has yet to claim their winnings. The sale was made last month when the pot reached $1.6 billion, the Ohio Lottery Commission said. Thorn: A truck leaving the Lima Refinery drove several miles while leaking a tar-like substance onto the road. PARTING SHOT: What’s the difference between baseball and politics? In baseball, you’re out if you’re caught stealing.